You need to be clear about the way that form-based applications use the interface and implementation sections in your units. The interface section is for declaring types, constants, variables and routines that you access from other files. Forms are accessed by the project file and need to be declared in the interface. Declare in the implementation section types, constants and variables that you only need to use within the same unit. Also put the code for all routines in the implementation section. You should decide whether your own procedures and functions should be methods of the form or separate. This makes a difference to how they are defined and accessed. In our tutorial on object-oriented Pascal we showed how public methods can control access to private fields. You might decide to write your own classes to 'encapsulate' your data in this way. (In our experience few school students at present have the expertise and confidence to write object-oriented Pascal code for their coursework). Usually your own routines (such as for sorting and searching data) do not need to be methods of the form. We see students struggling to debug advanced projects while they are experimenting with new techniques. We strongly recommend that you experiment with simple, well documented examples before introducing new types of code. We provide an example here of a relatively simple two-form application to demonstrate how to declare and use variables and procedures when they are part of a form and when they are separate. Note that each unit has the other unit in its uses section of the implementation. 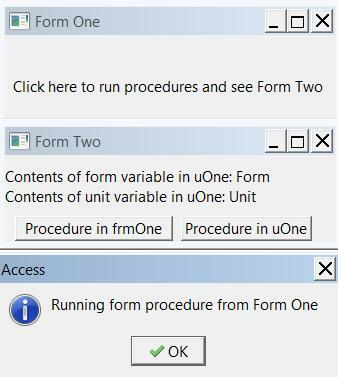 The click event procedure of Form One runs two ShowMessage procedures before showing Form Two. The captions of the labels in Form Two take data from the first unit. The buttons run procedures in the first unit. The following screenshot shows both forms and the message dialogue shown when you press the left button of Form Two. //Procedure is method of form so can name component without prefix frmOne.